The Wall Street Journal reports that Apple's manufacturing partner Foxconn (also known as Hon Hai Precision) has reopened its polishing workshops that had been closed since an explosion that killed three people and injured 15 others nearly two weeks ago. The company didn't disclose findings of its investigation. The comments came after Hon Hai, an assembler of Apple Inc. products and the world's biggest contract electronics manufacturer by revenue, had closed the workshops that handle polishing for electronic parts and products due to an investigation into the explosion. Foxconn opened the Chengdu facility where the explosion occurred late last year, seeking to diversify production away from its main facilities in Shenzhen, China. But analyst Brian White of Ticonderoga Securities reports that iPad production at the facility has been held back due to supply issues related to components used in the devices. Those issues had reportedly slowed the ramping up of production there even before the explosion, thus mitigating the acute affect of the workshops being taken offline following the explosion even as Apple and Foxconn continue to work to meet demand. Update: All Things Digital has published a statement from Foxconn noting that the explosion was in fact due to an accumulation of combustible aluminum dust in a ventilation duct and that the company has made changes to its ventilation systems and dust disposal policies to address the issue going forward. While the investigation into the tragic explosion that took place at our facility in Chengdu is ongoing, we have addressed the preliminary finding, that the accident was likely due to an explosion of aluminum dust in a ventilation duct, by putting in place improvements in workshop ventilation, a total revamping of the policies and practices related to the disposal of that dust, and through the application of new technologies that will further enhance the safety in these workshops. Poor workers, they are treated like slaves. Apple should do something about this! Here is a novel idea....how about letting the workers decide their own fate. They are free to leave AT ANY TIME. If they don't like their treatment, all they need to do is to leave. Not to sound cold hearted, but Apple's job is to make money for the shareholders (and Steve's pocket), not to solve human rights issues. The funny (sad?) part is, it's not one or the other. You can actually achieve both. And I'm fairly confident that Apple's bottom line, and Steve's pockets, are doing just fine. and go across the street to work longer hours for less pay, in a company that doesn't have journalist doing stories about it every month. Why don't you mention all the other companies that use Foxconn to manufacture their products? Do you think only the ones working on Apple products are treated bad? And so should everyone else. 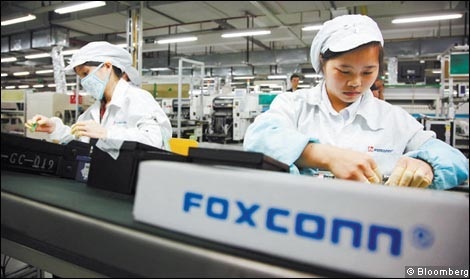 Every major electronic manufacturer uses Foxconn products. In Apple's defense, they do take many steps to affect positive change in the factories that make their products. It is also impossible to compete on a global level if you don't take advantage of the cheap labor offered by developing nations. It's my opinion that they could do more by not supporting countries like China. When business is done there, the government makes money. It also gains influence and is too quickly forgiven for it's many human rights abuses. The only alternative unfortunately is stateside manufacturing, which is ridiculously difficult as a result of our obscene tax code and overbearing regulatory system. The same could be said for manufacturing in the E.U. So many people on here, many of whom have never left their own state and certainly their own country, profess to know so much about the horrible work conditions and 'sweat shop" life of these workers on the other side of the globe. I wonder how work in this air conditioned factory compares to the toils of a rice paddy worker? These very well may be premium jobs in their society. I admit to not knowing. I just find it amusing how "damning" some people are of Apple and this factory while we have jobs that are actually more dangerous, dirtier and pay no more compared to the cost of living within our own nation. And probably not a one of us that doesn't have multiple products from a similar or same factory in China, be it the digital controls on your microwave, the guts of your car stereo, your artificial Christmas tree or $12 sunglasses. We should stop blaming Apple and start blaming ourselves (myself included), or just get over it. If you would include every other manufacturer who does business with Foxconn I might possibly agree with you. But attempting to lay this solely at Apple's feet and single them out for a boycott simply reveals extreme ignorance and Apple hating at ti's worst. That's really scary. Even materials that normally aren't explosive can create huge blasts if their dust is fine enough, it's at a high enough concentration in the air, etc. And, as an aside, aluminum dust is very nasty stuff even when it isn't exploding. During the filming of the "The Wizard of Oz" (1939), Buddy Ebsen was the original Tin Woodsman. His makeup contained aluminum dust, which got into his lungs and caused an allergic reaction. He got so sick that he was unable to breathe and was taken to a hospital to recuperate. Yes, shame on Apple for manufacturing their products there. and kudos to Dell, HTC, Samsung, Sony, Toshiba, Panasonic, Qualcomm, Microsoft, Vizio, Acer, Asus, and Nokia for manufacturing their products in factories with better conditions. You ever look inside an Xbox? Right on the casing is stamped the Foxconn name. Come on people! Get a clue! They employ a million people and manufacture way more than Apple's products.